26 coluors available -click to see color chart below. 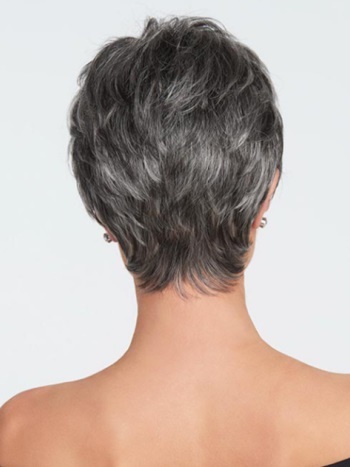 This short, boy cut is long on style and fullness. Beautifully tapered lengths throughout offer a multitude of styling options from full and soft to textured and piece-y. The slightly angled fringe can be worn onto the face or swept away while the razor cut nape creates a soft clean look in the back. 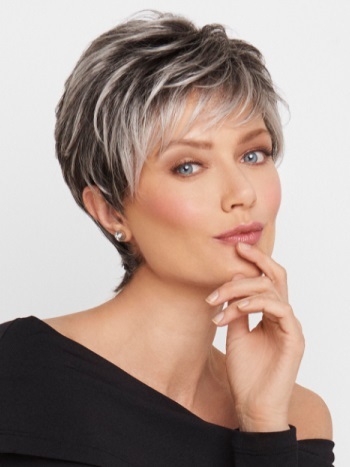 The Sheer Indulgence temple-totemple lace front monofilament top allows for natural looking off-the-face styling and parting options. The Sheer Indulgence lace front is 1" deep giving a natural hairline appearance. 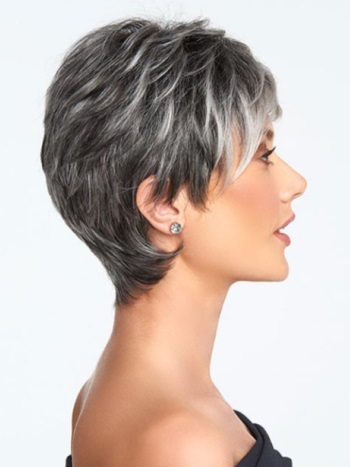 The Monofilament top material is sheer to blend in with all skin tones and gives a scalp like appearance. A Memory Cap II design is lightweight and the materials conform to the shape of your head after a few hours of wear. This style is suitable for Oval, Round, Square, Diamond, Oblong & Heart shaped faces. Front: 3.5" Crown: 4" Sides: 1.75" Back: 3.5" Nape 2.25"